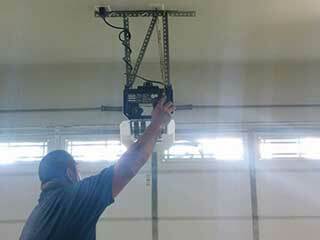 If you're experiencing problems with your garage door opener then you've come to the right place. Our skilled and fully qualified technicians are ready and waiting to help you with any issue that this electro-mechanical device could experience. We can also provide you with all the information you need if you're looking to buy a new unit, as well as perform the opener installation process at your convenience. There's a wide range of openers available on the market. You can find a number of brands and models with varying degrees of functionality. Openers generally fall into three categories, according to the type of drive system they have. Chain drive models are popular because of their longevity and price/quality ratio, but they can make quite a racket when they're working. A belt drive unit is a lot quieter and works much more smoothly, however, it will be more expensive. If you want a fast unit that requires very little maintenance unit then a screw-drive unit is the one for you. Its main downside is that it can be affected by temperature changes, and that it's not entirely silent. Once you have decided on the type of drive system that you want, you then need to consider the brand and model that's right for your needs. Our experts can help you make that decision, as the amount of options available to you can be quite substantial. Each brand has its own unique features to offer. Take LiftMaster and Genie openers for example; they both come with special rolling code technology which allows them to prevent tech-savvy burglars from exploiting their models. Then there are additional things like smartphone compatibility, or a backup battery system, that can really be a positive addition to your life. Don't wait until a problem gets out of hand before you call us. The sooner our technicians reach you, the sooner we can fix any issue you may have with your garage door opener. Things like a malfunctioning circuit board, or misaligned safety sensors will be dealt with quickly and safely. We can also help you with remote control problems, and even replace it with a new one if the damage is beyond repair. Our technician also carry all the necessary replacement parts with them, so we'll be able to provide you with a solution on the spot. No matter what type of issue you have with your opener, Garage Door Repair Olympia can find the best possible solution. We'll also be more than happy to help you get a new unit installed, so give us a call today to have our experts take care of whatever you need. Our team focuses on providing excellent customer service with every job we do. Our expert technicians can handle any problem, from broken torsion springs and dented door panels to malfunctioning openers and faulty wiring. We have a lot of experience to rely on, and we are always happy to provide our customers with professional tips and advice. Browse our website for more information about us and what we can offer you today. Thank you for choosing our company! Feel free to browse our website for more information in the meantime. Our team at Garage Door Repair Olympia is at your service any time!